This is a BIG e-News. Should I apologize? Better yet, just scan the calendar and the list of articles, and pick what most appeals to you whether it be Neighborhood News, Verona Road Project, Opportunities, April Election, or Messages from our Elected Representatives. Remember to VOTE on Tuesday, April 5. Who’s in office can make a big difference! Please refer to the list of articles under Opportunities for additional calendar events outside the neighborhood. They are arranged in date order. Tues., April 19, 7 pm – DMNA Council Meeting – Prairie UU Society Bldg., corner of Whenona & Crawford. Any resident may attend, but only Council members may vote. Notify President Jeff Glazer of your interest in attending. 26 - Who’s Up for Election April 5? It’s that time again – SPRING - and time to register for community garden plots in Marlborough Park. While there are many returning gardeners, turnover and the large number of plots – over 160 – guarantees that most would-be new gardeners will get a plot. An all-garden meeting and registration will be held on Saturday, April 2, from 1:00-3:00 pm and on Monday, April 4, from 6:30-8:30 pm at the Boys and Girls Club, 4619 Jenewein. According to the registration invitation, gardeners must come to one all-garden meeting and registration, not those on both dates. The card also noted that those who don’t register and attend the gardener meeting will lose their plot. (However, if you know you can’t come at either of those times, contact Nicole at 246-4730 x 208 by April 2 to request an application by mail.) Hmong gardeners can call Yee Ythao at 770-1074. Come prepared to fill out several forms and to pay for your plot at the time you register. Know all your contact information (address, phone, e-mail) and your gardening partner’s information if someone else will be working with you. Decide whether you want a no-till plot or a tilled plot. No-till plots require a lot of hand work, but perennials can be planted there and you can leave your fences up. Tilled plots are plowed and rototilled for you prior to opening day. Also be ready to provide your monthly or yearly household income. That goes on another form that does not contain your name. The Community Action Coalition for South Central Wisconsin, which leases the garden land from the City of Madison, has a sliding scale of fees. Last year’s fees were $10, $35, or $65 per 20x20-foot plot depending on income and number of people in the household. However, for several years some Marlborough Park gardeners have been protesting the large difference in rental fees and paying instead what they feel a plot “is worth” even though their income and household size might put them at a high level. Usually $20 or less per plot would be quite adequate to cover costs if they were shared equally among plots. The Marlborough garden treasury had a balance of $3,059 in the bank as of the end of January 2011. The Great Backyard Bird Count is an annual four-day event in February where people of all ages are encouraged to count the number and different kinds of birds they see in their neighborhoods. The results give a “birds-eye” view of where the birds are across the continent. Beginning and expert birders are welcome and you can spend as much or as little time doing the count. It is a great opportunity to learn to recognize the birds in your neighborhood if you don’t know them or to take the time to note what and how many birds are there. All this information is uploaded via the internet to the Great Backyard Bird Court web site at www.birdsource.org/gbbc/ <http://www.birdsource.org/gbbc/> and the results can be seen daily on a map of the US and Canada. It is very exciting to watch the dots light up in real time as the bird numbers are reported. All these activities, besides being fun and educational, are also great for the birds as the data collected is analyzed by scientist and bird enthusiasts to learn where the birds are and to investigate far-reaching questions. Here’s a peek at what you might have seen this year. Our list for the GBBC consisted of the usual goldfinches, chickadees, house finches, house sparrows, morning doves, and cardinals. Unusual birds for us were a great horned owl, who has taken up residency in our neighborhood, a red-bellied wood pecker that really has a red head, an American tree sparrow that is recognized by the dark spot in the center of its clear breast, and an unwelcome cooper’s hawk who likes to dine on our birds. We were also surprised and excited to see our first robins and a red winged blackbird. If you are looking for something to brighten up a dull February weekend, check out the Great Backyard Bird Count next year. After about ¾ of a year of trying to make a go at restauranting without alcohol, Faouzi’s Restaurant packed up and left its Beltline location around the end of January. The loss leaves the neighborhood without a great place to pick up a Moroccan meal and a convenient location for impromptu neighborhood meetings. Mr. Faouzi, a native of Morocco, was bitter about his experience in the neighborhood. On his best day, he said the restaurant brought in about $700. On the day he and his helpers were packing up, less than $10 had come in. He felt that the building’s owner had misrepresented the neighborhood and the number of patrons it might bring in. He was not pleased at what appeared to be drug deals that occurred in his parking lot when cars drove in and something was quickly exchanged before both cars drove off. Although he did not mention it, the fact that the Alcohol License Review Committee did not give him a liquor license was also a big factor in the restaurant’s demise. The income alcohol represents can often make the difference between success and failure. Faouzi had applied for a license in 2009, but the ALRC rejected the application until such time as certain criteria were met. One issue was some scrapes with law enforcement. Another was that the application wasn’t completely filled out. Still another was the percentage of revenue projected to come from sale of food and alcohol. Those ratios were changed from the original application but not supported by any particular facts. People from the neighborhood had opposed a liquor license for the Faouzi establishment and also for another restaurant proposed at the very same time 2 doors west on the frontage road at the corner of Danbury. The owner of the other building did not meet the requirements suggested by the ALRB, most notably a parking lot plan. That owner apparently gave up on pursuing a restaurant. Construction of the detention pond at the foot of Apache should begin soon. The purpose is to reduce both sediment and phosphorus going into Dunn’s Marsh. Sediment should be reduced by about 70% and phosphorus by about 53%. The project is being funded by a $100,000 grant from the Wisconsin Department of Natural Resources. A walkway will be built around the pond. The City of Fitchburg is applying for grant money to build a boardwalk to connect the walkway to the proposed Cannonball Path (the former railroad tracks along Dunn’s Marsh). “They want to cut Head Start, S.S.I. checks, medical rides, and W-2 checks.” So read the flyer offering rides from the Boys & Girls Club to the March 19th rally at the Capitol to demonstrate against the governor’s budget bills. 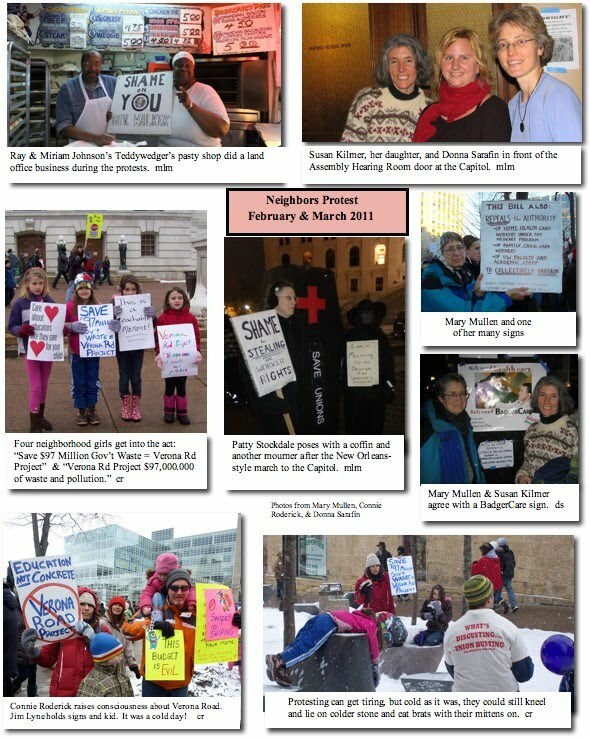 Of course this was not the first time Dunn’s Marsh neighbors made the trip downtown since February 11 when Governor Walker unveiled his budget repair bill and March when he unveiled his budget for the two years starting in July. Some neighbors joined the thousands at the Capitol on a daily basis! Neighbors Raymond and Miram Johnson’s Teddywedgers pasty shop at the top of State Street did a land-office business during the protests. When I caught up with Ray a couple of times at the shop, he said he was staying late to make more of those delicious meat and potatoes pies since he sometimes had run out. I grabbed a big hot one to share and later caught a portrait of him and Miriam with my sign. Check out the photo collages for some clever displays seen at the protest. Don’t say Wisconsinites don’t have a sense of humor even when protesting! In March, the DMNA Council decided to move its account from M & I Bank. M & I Bank is the employer of contributors who gave $5000 or more to Governor Walker’s election campaign. So… what’s happening in the neighborhood that the DMNA Council has learned about recently? In both February and March, the Britta Parkway CDA (Community Development Authority) housing was front and center. Visitors Agustin Olvera, CDA Director of Housing Operations, and Elizabeth Robers-Yszenga, CDA West Side Manager, attended in February and gave detailed information about how tenants are screened and how the Britta site is managed. In March, two Madison police officers attended the Council meeting and talked about their assignments related to both the CDA Britta property and to the Allied Drive area. “The more people call, the more CDA will do, and the police can go check,” she said. “We have a good relationship with the police,” she added. She noted that new lighting had been installed in the recent past and that JBN Security checks the premises every night. Robers-Yszenga also has weekly contact with Madison Police Officer John Patterson about the property. U-Haul will soon be locating a center on the vacated CUB grocery store property on the west side of Verona Road. Representatives detailed their plans to the DMNA Council in March. They are currently dickering with the City of Madison over where to locate their gas refill facility. In a very pleasant development, they suggested that they could make meeting space available to the neighborhood. Last summer the DMNA did not hold its traditional neighborhood picnic/potluck. This is an oversight that will hopefully be remedied this summer. Several Council members noted that this is how they first became aware of the DMNA and had enjoyed getting to know neighbors by attending. Discussions in both February and March point to a late July/early August picnic date. The DMNA and ADMNA are talking about collaborating to bring more neighbors together for this annual picnic in Marlborough Park. Keep tuned. Council meetings are held at 7 pm the third Tuesday of each month at Prairie UU Society, corner of Whenona and Crawford. The next Council meeting is scheduled for Tuesday, April 19. All residents are welcome, but only Council members can vote on motions brought before the Council. Please let President Jeff Glazer know if you plan to attend: President, Jeff Glazer, president@dunnsmarsh.org 277-1778. Yes, Mary, that would be me. As I got up here to Eau Claire 22 years ago, more and more people knew me by my nickname and most people know me as Duke around my city, region work and play groups. It's been a busy time with a lot of change. I retired from lawyering a couple years ago and now work for Trout Unlimited on watershed restoration projects across the Driftless Area. The last 25 years I've been active in mining, wetlands, small dam, and other resource issues, pretty constantly. IT was a lot more fun than lawyering, but maybe not as much fun as reporting. I still write a lot and am starting work on a book this spring. social worker, is concerned about her and other programs, is losing good people to retirement soon, and is stressed out but also marching and writing letters as much as possible. I also hope it will have an impact, and soon. But these are damn hard times. Wednesday we had an NRB meeting in Madison. I'm home now, but off to GB this aft for a Gathering Waters event. It's busy. I see Marlborough Park still has garden plots. How are you and how's the DMNA doing? Often I go back to my learning years as a citizen activist and think about you and Dave (Martin) and Ron (Johnson) and others in Dunn's Marsh. These days I garden in a plot rented from Eau Claire county on the north side. Jonathan Ela, who chairs the NRB, and I often talk about those days when we were both living in the DM neighborhood and learning the world. My NRB term ends May 1 and I don't think the new gov will reappoint me--heck, what am I saying?--there's no chance in the world I will be reappointed. But other opportunities beckon. Keep up all your good work. This was the opening sentence in an invitation by Stephanie Thomsen of Strand Associates to Verona Road Project Advisory Committee (PAC) members. The advisory group acts as sort of “focus group” to respond to proposals suggested by the consulting company for the Verona Road reconstruction project. Separate sections for each proposed change follow this article and the one following up on the PAC meeting. This meeting was attended by Carol Poole, Dorothy Krause, and Mary Mullen from the Dunn’s Marsh Neighborhood and several people from Orchard Ridge, Meadowood, and other areas on the west side of Verona Road, professional staff from Fitchburg and Madison, and others. Above: DMN residents Mary Mullen, Dorothy Krause, and Carol Poole (all standing) attended the Verona Road Advisory Committee meeting on February 10. Mary and Dorothy are DMNA Council members. Carol is a former member and now a Fitchburg Alder. Dorothy is running for Fitchburg Council. The election is April 5. Also pictured in Bill McCarthy, a long-time Verona Road activist, who lives on the other side of Verona Road. At its February meeting, the DMNA Council authorized writing a letter to WisDOT and Strand Associates thanking them for their response and asking them to address other concerns that had been raised in the comment period but not yet addressed. The letter was written by DMNA Council member Donna Sarafin. ADMNA President Selena Pettigrew joined the DMNA in signing the letter that was sent on March 15. WisDOT Verona Road Project Manager Larry Barta responded two days later. These are some excerpts from the DMNA/ADMNA letter and responses from Barta. Continuing, the letter from the Associations asked WisDOT to address concerns for air and water pollution. “Another concern that was not addressed at the meeting is what is being done to mitigate and measure the air pollution that is certain to rise to hazardous proportions after phase one? We already know that at the very least we will have an increase in the worst polluters on the highway, which are the diesel semi trucks. We would like to see a baseline monitor of pollution levels now and after the project completion. What is the status of this request? Resolving this issue in particular is deemed as critical to the safety of our neighborhood. Would you rather cross Verona Road near the Beltline by (a) zig-zagging at grade across 18 lanes of traffic, (b) by going around a loop and then up 23 feet on an overpass – about 1200 feet total distance - or (c) by using a wide gently-sloped 750-foot tunnel to get to the other side? The first alternative had been presented in the Supplemental Draft Environmental Impact Statement that was issued late last summer. The second had been suggested by citizens who commented on the SDEIS and was considered as a new alternative along with the tunnel idea that was developed by Strand Associates, the state’s consultant for the project. People attending the Verona Road Advisory Committee Meeting February 10, favored the tunnel alternative for the project scheduled to commence in 2013. Read on to find out why. Tom Lynch, from Strand Associates, pointed out that a long aerial pedestrian bridge would actually discourage pedestrians. Many pedestrians won’t take a route that is perceived as noticeably longer than other routes. They don’t like to climb to such heights either, he said. Another issue would be that the sides of the bridge would be walled in by big traffic signs since a pedestrian bridge just before the Beltline would hide signs that would ordinarily be placed on the Beltline itself. Lynch then presented the tunnel concept. He suggested that such a tunnel could be like those that cross under Lake Shore Drive in Chicago. Several committee members who had seen and used them were favorably impressed. Madison also has some wide pedestrian/bike tunnels. One crosses under East Washington Boulevard near MATC. Another passes under the bike path near the Kohl Center. A narrower tunnel goes under Verona Road near Raymond. Still another is located under McKee Road (PD) near Chapel Valley Road. A choice of widths could be considered from as little as 14 feet to as wide as 20 feet, with a proposed interior height of 8 feet. The City of Madison has requested that the tunnel be large enough for an emergency vehicle. Such a tunnel would pass 10 feet below grade and would have a gentle slope. It would be well-lighted. However, several potential problems were brought up and discussed. The graffiti issue would be addressed by vigilance and immediate painting. People also were concerned about unauthorized vehicles using a tunnel. Lynch said that unwanted traffic could be addressed by placing a bollard (post) in the middle of the entrances. Another issue is water runoff. Lynch said that for a 20-year storm this would not be a problem, but a 100-year storm could cause flooding. He said a check-valve and underground storage could solve runoff from such a storm. What about ice in the wintertime? Lynch said that water would not flow into the tunnel because the center of the tunnel would slope outward, but about 5 feet of ice might collect in front of the tunnel. While consultant Tom Lynch presented 3 different possible plans, the one that neighborhood residents preferred is called the jug-handle single roundabout. Under this plan, all traffic would proceed toward Allied much as it does now. However, one roundabout would be constructed, to be located under the to-be-raised Verona Road. Traffic could peel off in one of three directions: to Allied, on the other side Verona Frontage Road going toward the little tavern and Raymond Road, or toward the same Frontage Road going northeast toward Home Depot. This plan seemed much better than having 2 roundabouts or another option that would prevent turns toward the southwest. Under the favored plan, Atticus Way that leads to Avalon Village and Walgreen’s would stay just as it is today, a dead-end. Option B keeps the Frontage Road next to the Beltline rather than having it dip down into the neighborhood. This option was favored by the neighborhood. Although this option will result in demolition of 3 more business buildings just to the west of Whenona Drive, the extra space will allow road builders to put in an earthen berm to partially shield the neighborhood from Beltline noise. Lynch also mentioned that because of the curve of the Verona Frontage Road into the Beltline Frontage Road, the corner of the Highlander Motel would be cut into, and the motel would have to be demolished. Because of its demolition, a sound barrier 17 feet high would be built from the curve to Niemann Place. Another positive feature of locating the Frontage Road adjacent to the Beltline is a safer entrance to/exit from the Beltline pedestrian overpass. Under Option B the overpass would continue to empty onto a local street rather than onto a busier Frontage Road. During construction on Verona Road, a road called the Freeport Connection will be extended under Verona Road where the Southwest Bike Path runs. It will meet a new road coming down from Carling Drive and connecting to Allied Drive. Tom Lynch of Strand, consultant to WisDOT, said that the question of whether the road would become permanent or would be removed would be assessed after road construction finished. The issue of bicycle/traffic conflicts at the intersection was not addressed. Lynch repeatedly mentioned that there would be less conflict at the Lovell Road crossing because much of the vehicular traffic would use the Carling/Allied connection instead. To neighborhood people attending the meeting, this was an admission that there would be considerable opportunity for conflicts at the new intersection where there is now none at all because this is now only a bike/pedestrian crossing. In a surprise announcement, Tom Lynch, WisDOT consultant, noted that a wet detention basin previously proposed for the woods just west of Dunn’s Marsh could be located instead in the triangle of open space southeast of the CUB grocery store building. Both the DMNA and the ADMNA had asked for storage both on and under the project right-of-way. The underground storage idea was rejected by the City of Madison. Lynch reported that the City did not want to be bothered with the obligation to keep such an underground area clean. Meeting with lawyers from the Midwest Environmental Advocates (MEA) on February 21, six neighbors plus a resident of a neighborhood across Verona Road inquired about the possibility of pursuing a lawsuit against WisDOT regarding the Verona Road project. In brief, the answer was that we should wait to see the final environmental impact statement. At that point we would learn how each concern had been addressed. If some issues were not addressed or were inadequately addressed, then a legal challenge could be brought. Muster people to write letters to the editor raising issues of cost, environment, and environmental justice. Write our own notes about our experiences with DOT personnel and at the public hearing before details are forgotten. 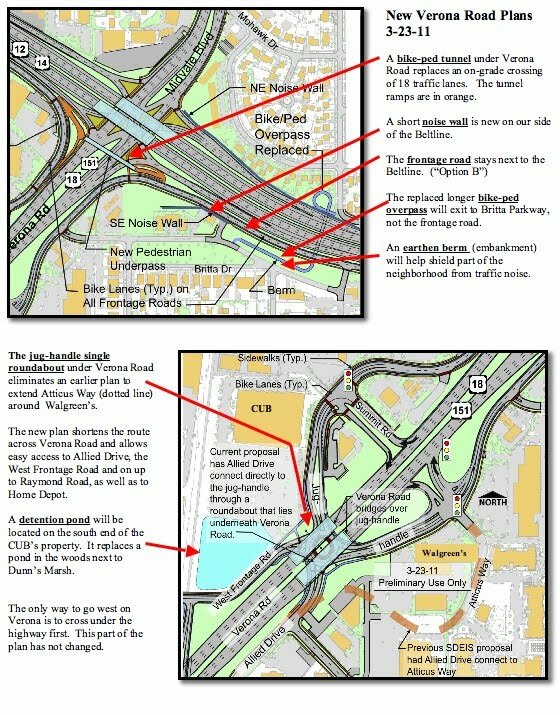 Become familiar with 2009 Wisconsin case that might have bearing on our concerns: Highway J Citizens Group v. U.S. Dept. of Transportation. This case dealt with highway expansion in Waukesha and Washington Counties. Recruit a lawyer to comment on the final Environmental Impact Statement. Attending this meeting from the neighborhood were Connie Roderick, Donna Sarafin, DMNA President Jeff Glazer, Jo Kelley, Kim Zinski, and Mary Mullen. They met with the two lawyers mentioned above and Kendra Wochos, MEA Litigation Paralegal. Adding a parallel deceleration lane to the Whitney Way eastbound off-ramp. Adding a lane to the Whitney Way westbound off-ramp to provide a dual lane off-ramp and revise the geometry of the off-ramp to improve the sight distance. Adding a parallel acceleration lane to the Whitney Way westbound on-ramp to improve the merging operations at the ramp. 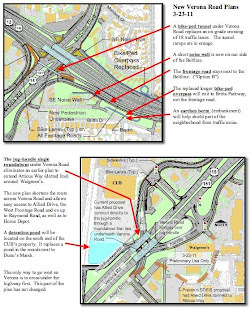 This ramp information will be more fully described in the Final Environmental Impact Statement (FEIS) for the Verona Road Study that WisDOT plans to release for public review and comment in May 2011. The public is invited to review and comment upon these changes in advance of the FEIS release at a public information meeting scheduled for Wednesday, April 6, 5:30 to 7:30 p.m., Toki Middle School Gymnasium, 5606 Russet Road, Madison. At the public meeting, residents will be able to view exhibits showing the planned improvements for the Whitney Way ramps. Information on noise impacts near the interchange will also be available. WisDOT staff will be on hand throughout the evening to answer individual questions on this new information and all other proposed Verona Road improvement details. If you are unable to attend the meeting and have any questions, please call Tom Lynch, Strand Associates, Inc.® at 608-251-4843 or Larry Barta, WisDOT, at 608-246-3884.
from Stephanie Thompsen, Strand Associates, Inc. While there’s been much talk of potential cuts to BadgerCare+, Wisconsin’s successful public health insurance programs, it is important for uninsured children and families in Wisconsin to know that BadgerCare+ remains a viable, affordable, high quality option for health care coverage. Maybe this was just what you were looking for – a dry-cleaning business close enough to walk to and where the price is just $3.99 per unit. Just such a business will be opening in May a 4522 Verona Road, across the highway from our neighborhood. The business will provide a livelihood for the owners, but even better than that, it will give a percentage of the profits to fund the Madison Apprenticeship Program (MAP). To help obtain funding for business start-up, the owners need e-mails indicating how often neighbors might want to bring clothes in for cleaning. Please click on the attachment “3 dry cleaner’s letter.doc” for more details. Then send an e-mail to TOPCleanersWI@gmail.com <mailto:TOPCleanersWI@gmail.com> to say how many garments per week or month you would most likely have cleaned there. Responding does not obligate you to actually have your items cleaned there. Responses should be in by Friday, March 25. This request was sent to all Allied Wellness Coop stakeholders. The Dunn’s Marsh Neighborhood Association is a Wellness Coop stakeholder. Come to a School of Education Program Information Session! Special Education, Secondary Education (Math, Science, English, Social Studies), Elementary Education, Kinesiology, and Rehabilitation Psychology. Why choose a School of Ed major? What kinds of volunteer or other experiences might be helpful for exploring this major? What kinds of courses should I be taking? What other things should I be doing in order to be ready to apply? What kinds of careers do these majors/programs lead to? You can sign up for as many program information sessions as you're interested in! If you have questions, please call Education Academic Services, 262-1651. Join Monroe Street Merchants for their 2nd Annual Monroe Street Chocolate Walk! Buy a bag for $15, and stop at over 20 participating Monroe Street shops and restaurants from the 1700 to 3500 blocks to receive a chocolate treat or gift. All proceeds will go to the Henry Vilas Zoo. You'll want to reserve your bag in advance by buying a ticket at Orange Tree Imports. Your ticket will be exchanged for a bag and a list of participants on the day of the event. Tickets are on sale in the store now. Please note: the Monroe Street Branch Library will host a spring book sale on March 26 -- another good reason to come to Monroe Street that day! On Saturday, March 26th from 7-10 pm, Prairie UU Society will be holding a wine, cheese, chocolate, and music party. Neighborhood residents – and in fact, anyone from anywhere – is invited to share in the fun. The object is to break up the winter blues and provide a chance for people to get to know each other and the church and its facilities better. If you’ve never attended an event in the building and are curious or just want a night out in the neighborhood where you’ll meet some friendly people, this would be a good opportunity. People can bring their favorite wine or cheese if they like. Childcare will be provided. For more information, contact Prairie at 271-8218. Prairie UU Society provides its facilities free to the Dunn’s Marsh Neighborhood Association for its monthly meeting and for other special events. How serious is the nuclear disaster in Japan? What do we know about the long-term health impacts of nuclear accidents, from the Chernobyl meltdown? Can nuclear power ever be "safe"? What are the implications for energy policies in Wisconsin and nationally? Robert Schuettpelz, Executive Director of Friends of Chernobyl Centers, U.S. The event is scheduled for 7 pm Monday, March 28, Room 202 (front lecture room) of Madison Public Library Central Branch, 201 W. Mifflin St. It is organized by the Wisconsin Network for Peace and Justice (www.wnpj.org) and co-sponsored by Preserve Our Climate Coalition. 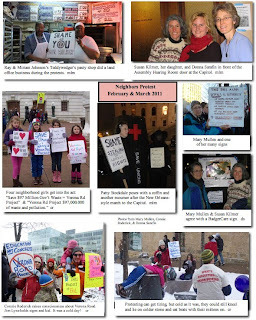 Be sure to check out Pam Kleiss' op-ed in the Wisconsin State Journal, "Keep nuclear safeguards in Wisconsin" which is posted on the homepage <http://wnpj.org/node/5257 <http://wnpj.org/node/5257> <http://wnpj.org/node/5257 > of the Wisconsin Network for Peace and Justice. Pam shares experiences from the 2 years she spent living and working in Japan. Have you ever wondered how to contact your policy makers at the local, county, state, or national level? Have you been unsure of how to testify and advocate on important issues? Wonder no more. Instead attend the Citizen Advocacy Project workshop “How to Make Your Voice Heard.” This workshop will be held on Thursday, March 31, 10:00-11:30 am, at Our Redeemer Lutheran Church, 1701 McKenna Blvd. Speakers will be Mickey Beil of the Dane County Executive’s Office and Helen Marks Dicks, Legislative Aid. The workshop is funded by the area Agency on Aging. The Citizen Advocacy Project focuses on training sessions to educate citizens on how government works and how they can become involved as advocates and serve on boards and committees. For more information, contact mstamstad@rsvpdane.org or 441-7897. OK, you bikers, electric car enthusiasts, bus riders, all-around green transportation forward-thinkers, and everyone else with a modicum of interest in future transportation. Thursday, March 31, from 5:00-8:30 pm is your time at Promega’s BioPharmaceutical Techology Center, 5445 E. Cheryl Parkway. The first 10 attendees to arrive on bicycle will receive a $5 Machinery Row gift card, and all attendees arriving on bicycle receive valet parking and are entered into a drawing for a $50 Machinery Row gift card. 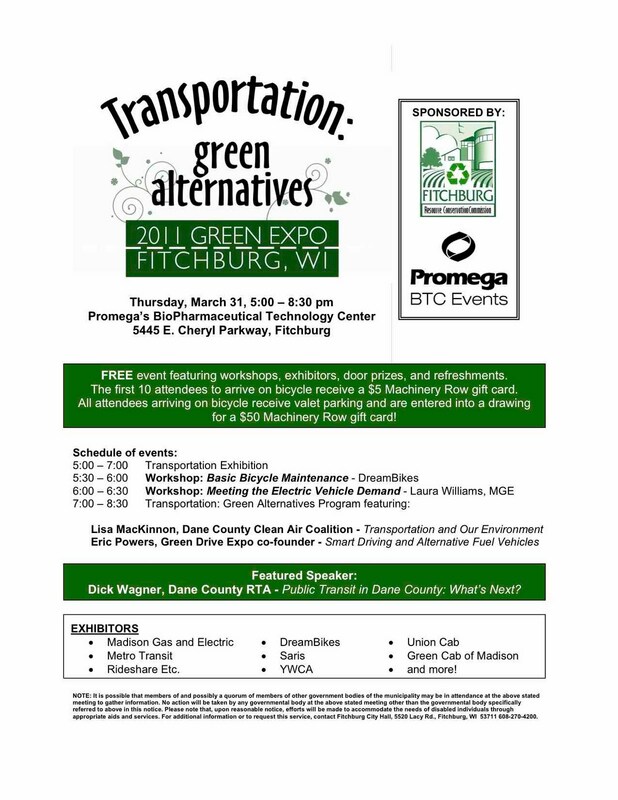 RSVPs are encouraged to be sent to rick.eilertson@city.fitchburg.wi.us, but are not required. Please feel free to contact Rick Eilertson if you have any questions, comments, or suggestions related to this event. I am happy to report that the Union Cab Board of Directors just passed the Driving for Democracy resolution that allocates funds to give people free rides to the polls on April 5. We especially want to reach out to the disabled community and seniors. I will pass along more details as they become available. Both Dane County and the City of Madison have referendum items that ask voters to check in on whether to support an amendment to the United States Constitution. A YES vote favors having an amendment to the U.S. Constitution stating that only human beings, not corporations, are entitled to constitutional rights. A NO vote means the voter does not favor changing the constitution to deal with the issue of the Supreme Court having declared that corporations have constitutional rights as persons. Votors will face good-sized ballot on Tuesday, April 5. State, county, school board, and local candidates will be elected, and some referenda will also be up for adoption. Because of the local elections and referenda, the Madison and Fitchburg ballots will be slightly different. Learn about the candidates and referenda from the League of Women Voter’s Candidates’ Answers. Candidates’ Answers can be accessed at http://www.lwvdanecounty.org/. Links to the candidate’s websites are generally available there. The printed version is also in this Thursday’s Ithsmus. Here are thumbnails of the local candidates who are in competition for the positions they seek. Solomon is Director of Wisconsin Job Service and serves on the Allied Area Task Force, the Community Services Commission, the Equal Opportunities Commission, and the Transit/Parking Commission. Farley has worked for the Greater Madison Convention & Visitors Bureau and the Dane County Human Services Board. He currently serves on the Madison Arts Commission and the Alcohol License Review Committee. He is an author and a professional speaker. Newcomers Dorothy Krause and Kevin Peterson are opposing each other in Fitchburg’s Aldermanic First District 1, Seat 1. Krause lives in the Dunn’s Marsh Neighborhood and has been active in both DMNA and ADMNA meetings as well as the Marlborough Community Garden, and is treasurer of the Dunn’s Marsh Neighborhood Association. She is the owner of Madison Freecycle, a recycling website connecting people who have things to give away and those who can use them. She also chairs the Communications Committee of Prairie Unitarian Universalist Society and has video-taped events for Fitchburg Access Television and other organizations. Peterson is the owner of Peterson Technology Group, member of Fitchburg Chamber of Commerce, Jamestown Neighborhood Association, and a Board member of the New Life Christian Center. In the past he served on the Fitchburg Broadband Telecommunications Commission and was a member of the marketing team for the Care Net Pregnancy Center of Dane County. It’s a clear choice between Eileen Bruskewitz and Joe Parisi for Dane County Executive. Bruskewitz is tagged as the more conservative, Parisi as the more liberal. Bruskewitz names her top priorities as reduction in taxes, stopping excessive borrowing and spending, and opposing any increase in the sales tax. She also emphasizes working with the business community. She supports initiatives such as the all boys’ school to reduce the school drop-out rate for youth of color and the disproportionate incarceration rate for minorities. Bruskewitz has served 11 years on the Dane County Board and is a member of several committees: Madison Area Transportation Planning Board (MPO), Land Conservation Committee, Zoning & Land Regulation, and others. Parisi emphasizes job creation and retention, especially in family-supporting clean energy jobs. He supports negotiating with workers to solve budget problems. Elected as Dane County Clerk for four terms, most recently he has won four two-year terms as a Democrat in the State Assembly where he got high ratings from environmental groups and also worked on women’s issues. In the Assembly he’s served on several committees including Corrections and the Courts; Energy and Utilities; Insurance; Labor; and Urban and Local Affairs. Longtime Madison residents are very familiar with former Mayor Paul Soglin, the boy wonder back in the 1970s. Two-term current Mayor Dave Cieslewicz will face off against him for the second time. Commentators characterize the differences as those more of style rather than substance. Both have been visible in the protests against Governor Walker’s budget bills. Jay Allen was elected two years ago as Fitchburg Mayor after having served on the Fitchburg Common Council for over 16 years. His website notes that he has a special interest in protecting wetlands, particularly the Nine Springs Creek and Lake Waubesa and has been President of the Fitchburg Days Committee since 2007. Regarding land use planning, a priority is to make certain that new neighborhoods are served by a variety of transportation modes. Shawn Pfaff is currently a Council member and a former member of Fitchburg’s Police and fire Commission. He serves on the Dane County 911 Center Board and is involved in the Fitchburg Lions Club and several other service organizations. He emphasizes working collaboratively with Council members, city staff, and citizens and allowing all voices to be heard at City Hall. He’s been involved in the City’s effort to build its new library. Otremba is a professional engineer in the building energy services market. Jeannie Porter is an attorney. Both have children in the Verona School System. The Belmar part of the Dunn’s Marsh neighborhood is in the Verona School District. Thursday Night / Special Council Meeting. We were called to a special meeting Thursday night, in the midst of the incredible, inspirational protests at the Capitol. We started on the steps of the City/County building: 18 alders, the Mayor, a few County Board supervisors, union leaders, non-represented city managers, Madison police, and Madison firefighters. In an incredible display of solidarity, we spoke about our respect for public employees (hey, I’m one in my day job too! ), marched around the Capitol, and settled in for a special City Council meeting. We passed several ordinances and resolutions, all unanimously, in support of city employees and collective bargaining. Along with meeting the Dalai Lama and passing the resolution that authorized the Allied redevelopment project, this was one of the most sublime moments of my time as alder. Here is my latest blog entry on the protests and what needs to happen to protect the middle class: http://solomadison.blogspot.com/ <http://solomadison.blogspot.com/> . Senate Bill 6 / Real ID. I authored a resolution that will be on Tuesday’s council agenda opposing Senate Bill 6, otherwise known as Real ID. I’ve already secured six co-sponsors and I expect this to pass easily. If interested, here is the text of the resolution: http://legistar.cityofmadison.com/detailreport/Reports/Temp/221201120125.pdf <http://legistar.cityofmadison.com/detailreport/Reports/Temp/221201120125.pdf> . Pasqual’s has moved north! After 25 years, they moved into the old Dardanelles space. This may allow the Monroe Street Fine Arts Center to finally expand and it’ll hopefully be great for Pasqual’s too. Check their site out at: http://www.pasquals.net/ <http://www.pasquals.net/> . Orange Tree Imports organized an awesome flash mob this winter. I forgot to send in my last update, but better late than never. It’s worth it. Video at: http://www.vimeo.com/18112636 <http://www.vimeo.com/18112636> . Hotel Red. There have been some informal inquiries from possible investors. Fingers remain crossed for some movement here. Monroe Street Chocolate Walk. Saturday, March 26, 12-4: Mark your calendars! 1700-3500 blocks: pick up chocolate walk bag, then visit 20 Monroe Street shops and restaurants for free chocolate gifts and treats. All proceeds go to the Henry Vilas Zoo. $15 a ticket, only 150 available! Buy in advance at Orange Tree Imports, 1721 Monroe Street. Monroe Street and West Lawn reconstruction: Reminder that Monroe Street reconstruction is scheduled for 2013. West Lawn is being completely rebuilt this spring. Held a meeting last week with the Engineering Department – and 28 residents showed up (including your alder, who also lives on West Lawn). Development projects: Two are currently planned. The first is an expansion of Empire Photography into a four story building: with Empire on the first floor and apartments on the top three. Julia Kerr and I held a neighborhood meeting on this last week and reception was mostly positive. The second project currently being planned is for the Parmans site. This would also be four stories, with the first floor being commercial / retail (ideally including a restaurant!) and the top three being apartments. I’ll host a neighborhood meeting on this sometime in March. Both projects have been presented to the DMNA Neighborhood Association. Jazz in the Park: Get it on your calendar – Saturday June 18th, Wingra Park. This year’s festivities will include MadiSalsa, Tony Castaneda, and the Edgewood Jazz Ensemble. Police / Crime / Safety Updates. The police department has been repeatedly praising the civility of the Capitol Square protests. See the latest: http://www.cityofmadison.com/news/view.cfm?news_id=2512 <http://www.cityofmadison.com/news/view.cfm?news_id=2512> . Allied Update. We have a task force meeting this coming Thursday (Feb. 24), where we’ll be hearing more about Phase II of the redevelopment, passing the Safety and Security report, and initiating discussions about the long term direction of the task force. The neighborhood association also applied for a grant to install informational kiosks at selected locations in the community. The wellness coop continues to meet and move forward with their vision, and the MAP program continues to build and expand in their new site. I am planning a trip to Milwaukee with Fitchburg Alder candidate Dorothy Krause and CDA Director Natalie Erdman to visit Will Allen and Growing Power to see about urban ag opportunities in Allied (http://www.growingpower.org/) <http://www.growingpower.org/)> . My deepest thanks and appreciation to Edgewood, Edgewood liaisons, Dudgeon Monroe Neighborhood Association, and Vilas Neighborhood Association for their great partnership on an MOU regarding the new Visual and Theatre Arts Center (VTAC). Construction will begin this spring. For more information, check out the VTAC website at: http://www.edgewood.edu/aboutEC/VTAC.aspx <http://www.edgewood.edu/aboutEC/VTAC.aspx> . Construction and trees. Woodrow Street residents are rightfully concerned about a change in plans that may cut down more trees than expected as part of construction. Edgewood is reviewing this concern to see what options exist. Master Plan. Edgewood put together some updates to the master plan, with support from Vilas and Dudgeon Monroe. However, these were’t fully integrated into an updated Master Plan and therefore did not pass Plan Commission. Edgewood is going to work on addressing this. Central Library Public Meetings. Just a quick reminder about upcoming public meetings for the new central library design. The first meeting was February 24, The second meeting will be Thursday, April 7, 7-9, and will present the final working design. For more information, check out the central library website at: http://www.madisonpubliclibrary.org/about/future/central.html <http://www.madisonpubliclibrary.org/about/future/central.html> . Hexavalent Chromium / Chromium 6. I’ve gotten a few consituent queries about chromium 6, so wanted to share an update with everyone. Here is a factsheet from the California Department of Public Health: http://oehha.ca.gov/water/phg/pdf/HexChromfacts082009.pdf <http://oehha.ca.gov/water/phg/pdf/HexChromfacts082009.pdf> . Regional Transit Authority / RTA Update. Most of us remain shocked and deeply saddened by Governor Walker’s decision to give $800 million back to the feds and set high speed rail back in Wisconsin for years. A week ago, I would have mitigated my shock by writing about our RTA and the possibility of a sales tax to improve transit access and options throughout the entire region. With increasing gridlock, the price of gas continuing to climb, more spatial mismatches between where people work and live, and increasing environmental justice concerns with highways (read: Verona Road expansion project), the time is now to make these investments. However, last week, the RTA voted not to hold a referendum this spring. Many believe they had no choice, with the state legislature making strong overtures toward eliminating RTAs statewide. Truly, it is hard to imagine things being worse in the state of public transit. I hope that, in the coming months and years, we can start to change this tide and realize the critical importance of public transit investments in Madison and throughout the US. For more information on the Dane County RTA, check out their website at: http://www.danecountyrta.org/ <http://www.danecountyrta.org/> . Here is our resolution, which I’ll be cosponsoring and supporting Tuesday night, opposing the elimination of Regional Transit Authorities in Wisconsin: http://legistar.cityofmadison.com/detailreport/Reports/Temp/2212011211328.pdf <http://legistar.cityofmadison.com/detailreport/Reports/Temp/2212011211328.pdf> . Spring Elections. Don’t forget to vote on April 5th! Elections will include the Mayor, County Exec, Supreme Court, and Alder!!! Greetings District 10 Residents. I hope this email, as always, finds you well. The Badgers are in the Sweet 16, spring is around the corner, and our city is once again front and center in the battle for equal rights. What’s not to like? One quick reminder that the spring election is on Tuesday, April 5. Make sure you get out and vote! Monroe Street Library Semi-Annual Used Book Sale: Saturday, March 26, 9:30 – 4:00. Donations of gently used books/videos/DVDs/CDs for the sale may be brought to the library at any time during business hours prior to that date, but no textbooks, magazines or records. Allied Drive Rally to Fight Poverty, Not the Poor: Most folks know that the proposed budget repair bill and biennial budget have major impacts on middle class public sector employees. But there are also numerous reductions to critical programs and services for low income families. I was very proud to participate in a seven vehicle caravan to the Capitol last Saturday, where dozens of Allied residents marched and chanted and reminded people that the fight for equality must not leave our most vulnerable behind. Hotel Red: Alder Kerr is holding a meeting on the new development proposal on Wednesday, March 30 at 6:30 pm at Randall School Cafeteria. I probably cannot make this meeting due to a conflict but I’m going to try. I believe Alder Bider-Sielaff will be attending as well. The new owner and management team (Inn Development and Management) is hoping to have the project up and running this coming summer. Fact sheet available at: http://www.cityofmadison.com/council/district13/documents/HotelRED-FactSheet-final2.pdf <http://www.cityofmadison.com/council/district13/documents/HotelRED-FactSheet-final2.pdf> . Zoning Code Rewrite: The very outdated Madison Zoning Code is finally nearing its end. The public hearing before the Common Council was on March 15th. We voted to move the process forward toward possible adoption at our next meeting, March 29th. This is a three year project and has involved over 100 boards and committees, including 29 separate reviews by the Madison Plan Commission. One of my all time favorite committee names, Z-CRAC (Zoning Code Rewrite Advisory Committee) will be working with Plan Commission in the coming months on the very important zoning maps that will be a key part of the final code. This process will include even more extensive public outreach. Styrofoam Recycling: The City has joined with Uniek Inc of Waunakee to recycle polystyrene packaging material. The first Styrofoam Saturday will be March 26th, where residents can drop off clean number 6 block styrofoam (block packaging material that is used around computers and other electronics), clean cups, and non contaminated food packaging. The collection will be held at the City Transfer Station, 121 E Olin Ave, from 9 am until 1 pm. Not accepting peanuts. For more info on what to do with peanuts, check out: http://www.countyofdane.com/pwht/recycle/categories.aspx <http://www.countyofdane.com/pwht/recycle/categories.aspx> . Parmans Redevelopment: I held a neighborhood meeting on this proposed redevelopment and counted 105 people in the audience! I couldn’t believe the huge turnout. The development team is proposing underground parking, first floor retail / commercial, and three additional (set-back) stories of apartments, currently planning 22 units. Some residents spoke in favor of the project but many had concerns. The major concerns revolved around appropriateness of the development on that site, traffic issues, parking, changes to the immediate neighborhood, and impacts on the arboretum. I’m working with planning staff and the development team to see what creative ideas exist and will plan a second neigborhood meeting sometime later this spring. Tenant Resource Center Iron Chef Competition: It is true. I will be an iron chef on Friday night to help raise money for the Tenant Resource Center. 5-7 pm, Brink Lounge. Come support your alder in his head to head competition against Roberto Yanez. If you can’t make it, feel free to send a donation directly to the Tenant Resource Center, 1202 Williamson Street, Suite 102, Madison WI 53703. Neighborhood Grants Program: Allied earned a very high score and will receive funding to place two informational kiosks throughout the community. This was a great team effort and I’m looking forward to getting these kiosks up. Meanwhile, Friday night is another community meal for anyone interested. I’ll sadly be missing it because of my iron chef competition the same night. Reflecting back on the past 14 years, together we’ve accomplished so much. When you first elected me as County Executive in 1997, there were around 390,000 of us who proudly called Dane County home. Today our population is some half-million citizens strong, making our county the fastest growing in the state. Families continue to choose our county because of the high quality of life we offer here. We have earned a reputation for working together and pursuing bold innovations. Over the past 14 years, we’ve solved challenges and gotten things done by bringing people together to ensure our county is the best place for families to work, live, and raise their kids. Our shared accomplishments are even more notable given the sharp contrast in leadership style we’ve seen from our state elected officials in recent months. Instead of pushing diverse and sometimes competing interests apart, we’ve brought them together. We worked with our unions and negotiated pay cuts and higher benefit co-pays at the bargaining table, respecting bargaining rights while savings taxpayers millions of dollars. We brought together builders and environmentalists to create our Conservation Fund under which we’ve protected more than 10,000 acres in our quickly growing county. We partnered on innovative reforms to our criminal justice system that saved taxpayers millions while making our communities safer. Over 14 years we’ve led major improvement projects - - a new state of the art courthouse to support our criminal justice system for decades to come, a fabulous new airport terminal that’s a beautiful gateway to our county, our first-of-its kind “Cow Power” facility to keep pollutants out of our lakes while generating locally grown, “green” energy and most recently we opened our new Badger Prairie county nursing home to care for our most vulnerable citizens. The accomplishments are many - - that’s what happens when people work together. That’s the Dane County difference and why I’ve been so proud to work for you for the past 14 years. During Women's History Month, we reflect on the extraordinary accomplishments of women and honor their role in shaping the course of our Nation's history. Today, women have reached heights their mothers and grandmothers might only have imagined. Women now comprise nearly half of our workforce and the majority of students in our colleges and universities. They scale the skies as astronauts, expand our economy as entrepreneurs and business leaders, and serve our country at the highest levels of government and our Armed Forces. In honor of the pioneering women who came before us, and in recognition of those who will come after us, this month, we recommit to erasing the remaining inequities facing women in our day. This year, we commemorate the 100th anniversary of International Women's Day, a global celebration of the economic, political, and social achievements of women past, present, and future. International Women's Day is a chance to pay tribute to ordinary women throughout the world and is rooted in women's centuries-old struggle to participate in society on an equal footing with men. This day reminds us that, while enormous progress has been made, there is still work to be done before women achieve true parity. My Administration has elevated the rights of women and girls abroad as a critical aspect of our foreign and national security policy. Empowering women across the globe is not simply the right thing to do, it is also smart foreign policy. This knowledge is reflected in the National Security Strategy of the United States, which recognizes that countries are more peaceful and prosperous when their female citizens enjoy equal rights, equal voices, and equal opportunities. Today, we are integrating a focus on women and girls in all our diplomatic efforts, and incorporating gender considerations in every aspect of our development assistance. We are working to build the participation of women into all aspects of conflict prevention and resolution, and we are continuing to lead in combating the scourge of conflict related sexual violence, both bilaterally and at the United Nations. In America, we must lead by example in protecting women's rights and supporting their empowerment. Despite our progress, too many women continue to be paid less than male workers, and women are significantly underrepresented in the science, technology, engineering, and mathematics (STEM) fields. By tapping into the potential and talents of all our citizens, we can utilize an enormous source of economic growth and prosperity. The White House Council on Women and Girls has continued to remove obstacles to achievement by addressing the rate of violence against women, supporting female entrepreneurs, and prioritizing the economic security of women. American families depend largely on the financial stability of women, and my Administration continues to prioritize policies that promote workplace flexibility, access to affordable, quality health care and child care, support for family caregivers, and the enforcement of equal pay laws. I have also called on every agency in the Federal Government to be part of the solution to ending violence against women, and they have responded with unprecedented cooperation to protect victims of domestic and sexual violence and enable survivors to break the cycle of abuse. As we reflect on the triumphs of the past, we must also look to the limitless potential that lies ahead. To win the future, we must equip the young women of today with the knowledge, skills, and equal access to reach for the promise of tomorrow. My Administration is making unprecedented investments in education and is working to expand opportunities for women and girls in the STEM fields critical for growth in the 21st century economy. As we prepare to write the next chapter of women's history, let us resolve to build on the progress won by the trailblazers of the past. We must carry forward the work of the women who came before us and ensure our daughters have no limits on their dreams, no obstacles to their achievements, and no remaining ceilings to shatter. NOW, THEREFORE, I, BARACK OBAMA, President of the United States of America, by virtue of the authority vested in me by the Constitution and the laws of the United States, do hereby proclaim March 2011 as Women's History Month. I call upon all Americans to observe this month and to celebrate International Women's Day on March 8, 2011 with appropriate programs, ceremonies, and activities that honor the history, accomplishments, and contributions of American women. I also invite all Americans to visit www.WomensHistoryMonth.gov <http://www.womenshistorymonth.gov/ <http://www.womenshistorymonth.gov/> > to learn more about the generations of women who have shaped our history. IN WITNESS WHEREOF, I have hereunto set my hand this twenty-eighth day of February, in the year of our Lord two thousand eleven, and of the Independence of the United States of America the two hundred and thirty-fifth.